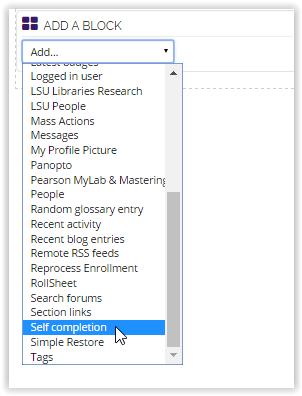 The Self Completion block allows students to manually declare they have completed the course. Instructors must add the Self Completion Block AND Enable Manual Course Completion criteria in order for students to use this. For information on enabling the Manual Course Completion option, see GROK article Edit Self Completion Criteria. 2. Click on Edit to turn editing on. 3. From the Add a Block dropdown menu, select Self Completion. 3. The Self Completion block should appear in your course. Students will click on the Complete course link and verify they have completed the course. NOTE: Using this link and the self-completion option does NOT affect student grades. 4. Follow the instructions in this GROK article to Edit Self Completion Criteria.